Cajones vs. Posers Champions always win. But heroes always win with style. Those marvels who inspire awe and color their sport with so much heart and personality and style, they achieve immortality. The revolutionary X-14 can relate. With sleek lines and liquid curves even the waves envy, the X-14 looks like a sculpture on loan from the Museum of Modern Art. 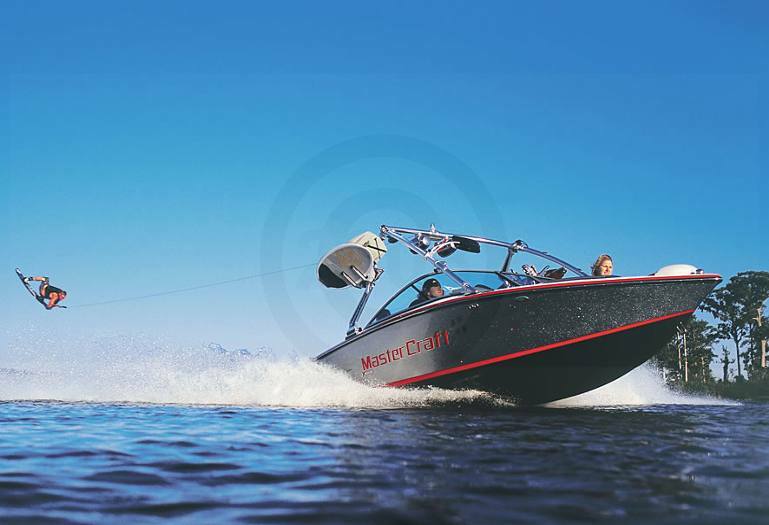 As a spacious, world-class towboat, the hull is configured for flat slalom runs with the throttle forward and fat, rounded wakes with the throttle eased back. A KGB ballast system adds precisely the weight you want to enable you to become your own wake designer. And plush, wrap-around seating with a lounge accommodates the crowd that will assemble to honor their conquering hero. 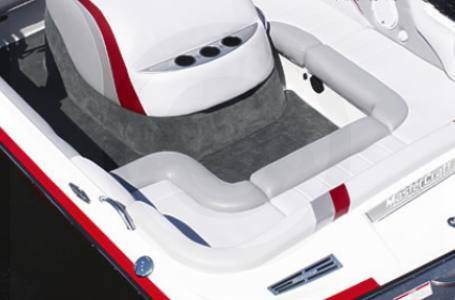 BOW SEAT: TUCKED INTO THE APEX OF THE X-14'S OPEN BOW IS A CUSHY SEAT WITH EXTENDED BACK SUPPORT. IT SITS NICELY BETWEEN THE TWO BOW SPEAKERS FOR PERFECT STEREO BALANCE. STEERING: THE FEELING IS ALL STATE-OF-THE-ART AT THE CONTROLS. THE HELM FEATURES PRECISION TOUCH II RACK-AND-PINION STEERING SYSTEM AND MASTERCRAFT SERVO-DRIVEN ELECTROMECHANICAL CUSTOM GAUGES. LOUNGE SEATING: MANY CONSIDER THE X-14'S LOUNGE SEAT THE BEST IN THE HOUSE. SUPER COMFY AND A GREAT VIEW OF ALL THE ACTION BEHIND YOUR BOAT. Length Of Boat With Platform: 23'8"
Overall Length with Trailer: 23'4"
Overall Length with Swing-Away Tongue Folded: 22'2"
Overall Width with Trailer (Single Axle): 102"
Overall Width with Trailer (Tandem Axle): 102"
Single Axle Trailer Weight: 900 Lbs. Tandem Axle Trailer Weight: 1,050 Lbs. Tow Bar Height to Waterline: 7'2"
Boat Weight: Approx. 3,000 Lbs.